The original website for this page can be found here and is quite amazing for it's incredulous lack of any sort of skepticism. My comments on the webpage will be found in red. Jim Scotti, 2001 October 3. What NASA did was to land 12 men on the moon - quite amazing! Obsessions can be a bad thing if critical thinking is not part of the obsession. This uncritical hoaxer apparently doesn't pay much attention to the details (unless he can contort those details into his own errant purposes). There are 3 parts to the "flag waving" on the moon. First, the flag was made to look like it was waving by the use of a rod across the top of the flag to hold it out horizontally. This was well documented at the time of the landings and is often cause of a hoaxers claims. Second, when an astronaut adjusts the flag, it will wobble around first while the astronaut is adjusting it and then for a few moments afterwards as the imparted momentum damps out. Third, the flag definitely waved in the breeze of the rocket exhaust when the LM ascent stage lifted off the moon carrying the crew back home. Funny how I've also "scoured" nearly every NASA film, photo and report, yet with my skeptical scientific approach, I fail to see any of the fakery that Mr. Rene claims to find. I find awe and wonder, but it is for the spectacular success and scientific discovery that Apollo brought humanity. I wonder how much Mr. Rene sells his book for? I wouldn't waste my money on such an uncritical work. Panicked? Yes. But also a very determined America. The estimated cost of landing on the moon at the time of Kennedy's speech on May 25, 1961 was $10-20 billion dollars, not $40 billion (an inflated cost, not the actual cost of Apollo during the 1960s). I don't know of any real astrophysicists who agree with Mr. Rene. Every Planetary Scientist and Planetary Geologist who I know are convinced of the genuine nature of the Apollo program. As with most hoax webpages, the claim that "seven Apollo ships headed to the Moon" is wrong - eight made the trip during those years and a 9th made the trip at the end of 1968, though his claim of "seven" would be correct if he limited it to those intended to land on the moon. I'd be interested to see how the moonrocks could be "mocked up in the lab". The fact is that they cannot be faked. The moonrocks are not like any other rocks seen before the first moonlanding. They are not similar to meteorites. They are not similar to any known Earth rocks. In fact, they are completely consistent with the claims that they came from the moon after being formed there and affected by the lunar environment for nearly 4 billion years. Ask any real Geologist to examine them and he will agree with the claims that they came from the moon. A close examination of the photographs and film by a true skeptic will find them to be entirely self consistent and consistent with their being obtained on the moon. The claims of fakery are easily debunked with some simple examination. Apparently, Mr. Rene does not remember the TV technology of the day, particularly when pushed by the limits on weight and power placed on the equipment flown to the moon. The state of the art for video recordings was called a kinescope which was indeed filming a TV screen with traditional film. However, there was a live direct feed from the downlinked video into the networks during Apollo. The claim that "The astronauts took thousands of pictures, each one perfectly exposed and sharply focused" could not have been made by anyone who has actually examined all, or even a substantial subset of the photographs obtained on the moon by the Astronauts. If one is limited to those images released as press releases to the public shortly after the flights, then one might get the mistaken impression that they were all perfectly exposed and focused. But the NASA PAO released those photographs which were the best of the lot. Surf to the Apollo Lunar Surface Journal and follow the links to the image library and examine them (skip past the high resolution scans which are mostly of the good quality images). You'll find that there are many imperfect images amongst those taken on the lunar surface. This is a blatant example of how the hoaxers either lie or stretch the truth to fit their purposes. The casual reader of the hoaxers baloney who do not followup with their own investigation are easily conned into believing the hoax. As Rene points out, that's not all: The cameras had no white (sic) meters or view ponders (sic). So the astronauts achieved this feet (sic) without being able to see what they were doing. There film stock was unaffected by the intense peaks and powerful cosmic radiation on the Moon, conditions that should have made it useless. They managed to adjust their cameras, change film and swap filters in pressurized suits. It should have been almost impossible with the gloves on their fingers. The cameras had no light meters or viewfinders (don't know where the author of this webpage got "white meters" and "view ponders" from...), but the lunar scenes and the exposures needed to record them were very predictable. The astronauts practiced pointing and exposing their cameras for quite a long time before the flight. The exposures were set for both light level and focus distance by pre-mission settings. If the crew was taking a photograph to document a sample, he knew that the focus distance was nearby. By using apertures with f-stops in the mid to high range, he also had the advantage of having a lot of depth of field, meaning that objects would appear in focus over a wide range of distance, so focus wasn't that critical. Mr. Rene's credulous claims that the couldn't have taken proper exposures is simply wrong. Changing film was a simple matter of sliding in a darkslide and sliding the filmback off. The filmbacks contained enough film for several hundred images and the film was motor driven. They did not use filters on the Hasselblad cameras which had a handle with a trigger that was easily tripped in a gloved hand. NASA was smart enough to use cameras designed to be used with gloved hands and fingers. This web author doesn't even bother to get the man's name right, it was David Percy. Apparently "photographer" Percy lacks experience with basic lighting priciples and with the interaction of light and shadow. Where he sees shadows going in different directions, I (also an amateur photographer) see undulating lunar surface and issues of perspective (which I remember learning about in grade school art classes!). If there were multiple light sources as he describes, there would be multiple shadows cast by the astronauts and their equipment and the lunar surface. There are no such features. And even though the sun is the only light source on the moon (well, not quite - there is also the Earth, but it is far too faint to account for things this hoaxer describes), the sunlight not only lights up things on the moon directly, but also by scattering off of the moon surface, the astronauts, their lunar module and their equipment. Where Percy suggests spotlights, I can demonstrate that there is light reflected off the gold foil of the lunar lander in one such example! The flag and words that are refered to are those on the side of the Lunar Module. They are lit up by scattered light off of the lunar surface and other equipment. Apparently, "photographer" Percy does not know about simple techniques used to light up dark shadows in the studio or in the field here on Earth. I can show you many many examples of photographs and how they relate to the video taken at the same time by the astronauts. Claims that they don't match are simply Percy's or Rene's opinions. Wait, wait - Percy claims there are mistakes? I thought Rene claimed the thousands of pictures were all perfect. Again, it appears that the hoaxers themselves are contradicting themselves and they are apparently taking issue with a subset of all the actual images. These guys can't even agree on what their truth is, let alone recognize it in the available evidence provided by NASA. If, if, if. If Percy is wrong and the pictures are not fake, then this is just one more very large collection of evidence nailing the coffin on their hoax theories. Since they have not been demonstrated to be fake by the hoaxers, the last question by Rene is irrelevant and idle speculation. Radiation is another case where the hoaxers just don't know what they are talking about, relying on scare tactics to make claims that the radiation in space is stronger and more damaging than it really is. The Earth is not "protected by the Earth's Van Allen belt", but those belts are bands of trapped and enhanced radiation. Apollo flew through those belts very quickly and normally avoided the most dangerous parts of those belts altogether. Once outside the belts, the radiation level drops back down to a very low level. The Apollo astronauts were typically exposed to about 1 or 2 rem of radiation during a flight to the moon and back - about 1% of a dangerous dose and the equivalent of about 100 dental x-rays. The flares mentioned in this particular paragraph were not the large and dangerous solar flares, but instead smaller insigificant flares. Lies or exaggerated facts once again. This claim is taken totally out of context and probably describes what would be required to shield against the strongest radiation affects possible (for example to shield a lunar base from long-term exposure), but not the typical levels that were actually measured with dosimeters carried by the crew. There were no such strong flares experienced during Apollo. These claims are total bunk. BTW, several of the Apollo astronauts have died from cancer. Is it signifantly more often than would be expected of men of their age group? Probably not. The lack of any real research plagues this claim. Every Apollo flight experienced many malfunctions. Luckily, there was a great deal of redundancy and the critical components were heavily tested and very robust so that few malfunctions were life or mission threatening. These hoaxers do not remember the 1201 and 1202 computer alarms of the Apollo 11 descent. They don't remember the lightning strike on the Apollo 12 vehicle during launch. They don't remember the troubles docking the Command Module with the Lunar Module during Apollo 14, or it's landing radar and abort switch difficulties during landing. They don't remember the dangerous failure of a backup circuit that controlled the steering of the service module main engine on Apollo 16. They don't remember water leaks, malfunctioning switches and lights and other equipment problems experienced by all the flights. They conveniently forget just how many minor problems were actually experienced during the flights to the moon. The 24 men who flew to the region of the moon truely were far out on a limb, one critical failure from death and it is a tribute to the 100s of thousands of workers who built the spacecraft and supported the missions that they came off so well. It could be because of a lie, or it could just be the stong emotions he felt remembering what it was like and how spectacular it was. Or it could be that this never happened. The hoaxers are known to make up events or interpret events to suit their own claims. First, Gus Grissom did not hang a lemon on his Apollo capsule. He did hang a lemon on his Apollo simulator which never quite caught up to the changes in his spacecraft and suffered continuous problems and breakdowns. Grissom also recognized the significance of his being the commander of the first flight of 2 different spacecraft and also knew of the dangers of flight testing unproven hardware. Every astronaut in the program knew what fueled Gus Grissom's fears and it was simply the dangers of testing unproven equipment. If he or anyone else had thought of the particular test being dangerous, things would have been treated differently. In hindsight that extreme hazard of testing in pure high pressure oxygen cabins is obvious. But NASA had tested every other manned spacecraft in very similar conditions without a single incident. It was a failure of imagination, not a deliberate or careless accident. The claim of a total of 11 astronauts killed is another of the false claims. Flying high performance jets (the T-38s used by the Apollo astronauts not only for proficiency but also just for travel were still quite new in the 1960s) is a dangerous business. 2 astronauts died in one crash in 1965, 2 more died in separate crashes, one due to a bird strike. And one died in a car accident. Including the Apollo 1 crew, that adds up to only 8 men, not 11. To get 11 "astronauts", one must include several non-astronauts and if this claim is like the others I'm familiar with, that includes the likes of Ivan Kincheloe, Mike Adams, and Robert Lawrence. Kincheloe was an Air Force pilot killed in a plane crash and had no relationship with the astonaut corps. Adams died in an X-15 accident. Lawrence was killed in a jet accident just after reporting to the Air Forces Manned Orbiting Laboratory (MOL) program. Again, this demontrates just how loosely these hoaxers run with the facts. Every failure in spaceflight, be it in manned or unmanned flight is part of NASAs way of correcting mistakes. You learn from your mistakes by understanding what went wrong so you can prevent it from happening again. That's why the Apollo Spacecraft flown on the last flight to the moon was so much safer than that flown on the first moonflight. The astronauts were the best pilots of their era and all had the "right stuff". Some had more of it than others and those men were generally the commanders who led the most challenging and dangerous missions. NASA and their representatives have responded over and over to the claims of the hoaxers. It is a waste of their time to repeat what has been said over and over again. Sending these hoaxers to webpages by various of us who have chosen to address their claims is a much better use of their time. Today's NASA PAO is nearly 30 years removed from the Apollo program and many of those who work for NASA were not even born when Neil Armstrong walked on the moon. Apollo is, unfortunately, history. I would like to see these hoaxers use 1960s or even 1970s film technology to generate a faked moonwalk which could fool a whole generation of scientists who have examined the Apollo evidence. They won't be able to because it is not possible. They would have to take the Apollo hardware to the moon to "fake" a moonwalk. Things like the flight of dust kicked up by the astronauts boots or by the tires on the rover cannot be simulated without 1/6 G and no atmosphere. Take a look at the HBO miniseries "From the Earth to the Moon" for a state of the art 1990s simulation of walking on the moon and you'll see even there that their lunar simulation is far from perfect. Funny thing - the liftoffs of a Saturn V rocket is probably the most difficult part of getting to the moon! The Saturn V rocket was the most complex vehicle and the most explosive and dangerous collection of rocket engines and propellants ever assembled at that time. It is the Saturn V rocket itself which enabled the Apollo spacecraft mounted at it's nose to actually reach the moon. Tracking the rockets and spacecraft around Earth and the moon was not that difficult and if they had re-entered a day or two later, the whole Earth would have known about it since the Soviets watched our missions almost as closely as we did. Planning? Hardly. And it has a name? Until NASA actually recieves any funding for such a Mars mission, it is only a dream, just as going to the moon was only a dream of farsighted men of the 1950s. I hope someday soon we will see flight to Mars and back to the Moon, but for now, it is still too dangerous and expensive and does not have enough political support to be funded. Mission Controls jokes about a slicing golf ball is just that. The ball did not slice and it did not travel all that far since swinging a golf club in the bulky lunar EVA suits was not easy. This claim is a straw man argument - false from the very start. A small amount of research would have provided the explanation to this "oddity". The last 3 lunar landings carried a lunar rover to the moon to extend the range of exploration of the astronauts. The rovers carried a remotely controlled TV camera which was used to record the lunar liftoff of Apollos 15, 16 and 17. Again, a trivial amount of research would have shown that the TV camera deployed later was placed on the "MESA", the "Modular Equipment Storage Assembly" on which various equipment and tools for the moonwalk were stored. As the commander crawled out onto the porch at the top of the ladder of the LM, he pulled a D-ring which opened the MESA and it folded down to a near horizontal position. The TV camera mounted on the MESA was aimed so that it would look back towards the ladder in order to show the first steps on the moon. How much pressure is a football inflated to? The space suits were inflated to about 4.5 PSI which made moving in them difficult but not impossible. The joints were built to allow easier movement and the most difficult part of working on the moon was using your hands to grip equipment since you had to work against the pressurized space suits. It is said that starting with Mike Collins space walk on Gemini 10, astronauts were seen often walking around JSC in Houston squeezing tennis balls suring their training in order to strengthen their hands and forearms in preparation for EVAs. Why should they make some signal visible form Earth? They already carried TV cameras and photographic cameras. Anything other than the tasks at hand to collect rocks and deploy experiments was a waste of valuable time on the moon. One of the experiments deployed on 3 of the 6 landings was a laser retroreflector which is still used to bounce laser light off of to measure the distance to the moon. Look more closely. The Hasselblad cameras were mounted on the chest pack on the space suit. You can easily see the camera if you look at that particular image. The image (presumably the one below which shows John Young jumping and saluting next to the flag on Apollo 16) demonstrates the undulation of the lunar surface so that the shadow of the flagpole is seen to meander a bit, first behind the rock, then along the rim of a subdued crater. The flags shadow itself is off the frame to the right. The astronauts shadow is the thicker shadow that the web author has mistaken for the flags shadow. You might also note from the light and shadow on the astronaut that the sun is from slightly behind and left so that shadows are actually angling towards the camera. The flag appears to flutter because it is held outstretched by a rod across it's top. It's somewhat wrinkled because it was folded up while being carried to the moon. It's simply hanging like a curtain from the rod in order to give it a natural look for the camera. This was very well documented at the time of the flights to the moon and in some images, you can even see the rod and the way the flag is attached to the rod (which was hinged to unfold out perpendicular to the pole). The flag is lit directly by sunlight. The errant assumptions by the author in the previous section were wrong, so the question is not relevant here. There are some pictures showing some flags backlit - the flags were usually off-the-shelf flags from the day and were somewhat translucent when lit from the back, especially when held against a dark or even black background. The hoaxers claims that stars should be visible in the lunar surface photographs is wrong. The lunar photographs were exposed for the brightly lit daylight surface. A daylight exposure on Earth at night would not show stars either because they would be badly underexposed. Similarly, the astronauts did not see stars in the lunar daylight skies because their eyes were adjusted for the brightly lit scenes around them. Under the right conditions, particularly in their spacecraft on the far side of the moon and the dark side, they were able to see stars when their eyes were properly dark adapted. A few calculations would solve a lot of the question here. 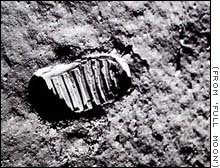 First, how can you see the impression made by the lunar landers footpads on the moon? The depression they made is covered by the pads themselves. The pressure of the astronauts boots on the soil turns out to be about 0.4 psi while standing still on both feet and may have been about 1.5 psi while moving (bouncing up and down one foot at a time). In 1/6 G, the LM weighs only about 3000 pounds. The footpads were at least 24 inches in diameter which would give them a total area (under all 4 pads) of at least 1800 square inches so the pressure on the surface is less than 2 psi - not much more than the astronauts boots carrying the weight of the suited astronaut! As for the blast of the rocket engine on the lunar surface, the engine fired at about 3000 pounds during landing and the LM nozzle was some 5 feet in diameter which gives an exhaust pressure of only about 1.5 psi impinging on the lunar surface. Claims that no affects are seen in the dust under the LM are once again simply wrong. There are a number of photographs showing the outward blast pattern in the dust. There is simply no blast crater (and why should there be a blast crater?) to be seen under the LM. One can even see a trail along the ground path in some photographs taken during Apollo 12. Last updated, 2002 August 6.